It's no secret that we reckon the dining room is one of the most important spaces in the home. From simple weeknight family dinners, to weekend dinner parties where you socialise with friends until the early hours, the dining room can be the room where some of the sweetest memories are made - and the most incredible dining room can make those moments all the sweeter. Though the dining rooms we're about to show you are all kinds of beautiful, we also know that the spaces in which they sit are largely unattainable! So, keep an eye out for our tips for scaling down the extravagance while still embracing a stylish look. Not all of our homes can be as grand as these, but that doesn't mean that we can't take inspiration from them! 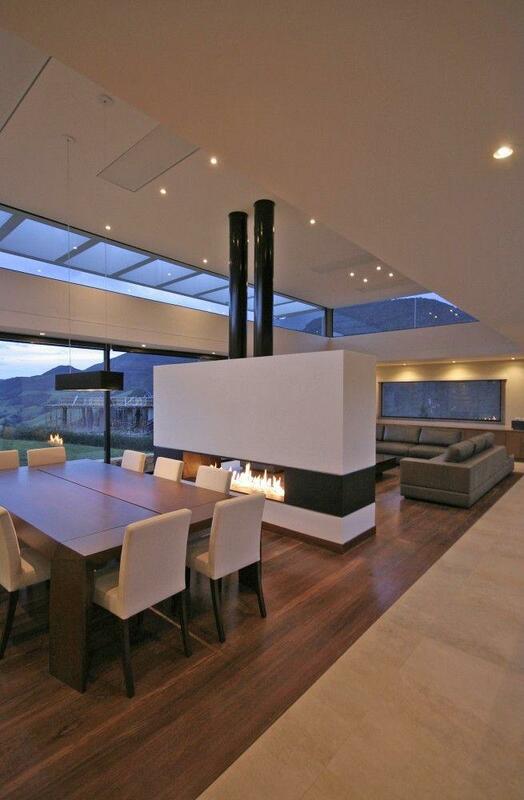 If you do have a dining room of incredible proportions, however, do let us know - we'd love to see it! 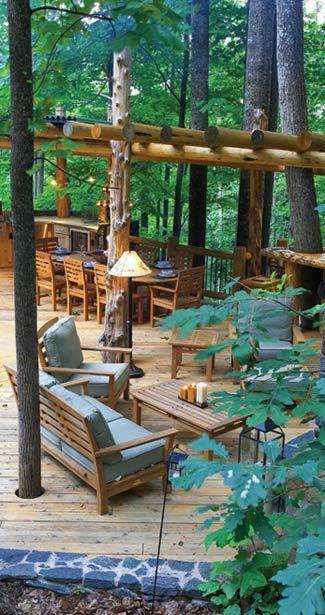 From leafy forests to palm-adorned patios, there are few things better than taking your dining room outside and enjoying a meal al fresco! Though we might not always have the climate for that in the UK, these incredible homes have certainly got the dining style to match their tropical location. 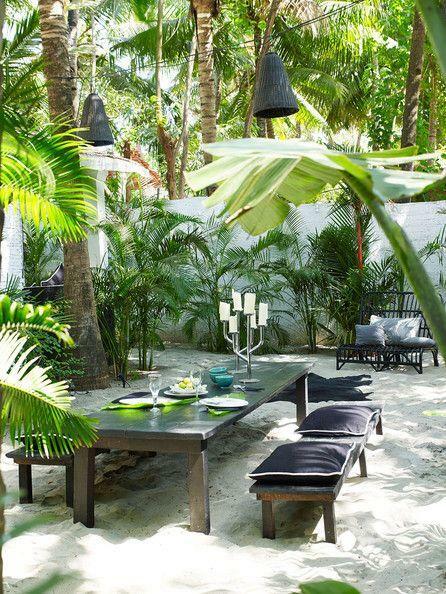 Sandy floors with the shade of natural palm leaves might not be a common occurrence in the British back garden, but when in the right scenario - make the most out of nature! Wooden furniture tends to complement this natural scene, and is hard wearing enough for when the inevitable tropical storms arise. 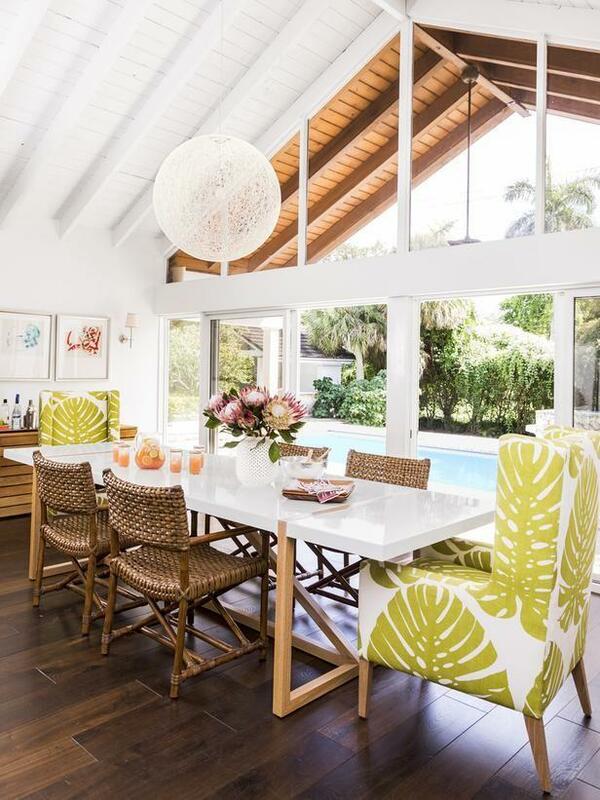 Accented with durable candle sticks (great for light and keeping the mossies away) and soft furnishings (for comfort, and keeping warm when the sun goes down), these paradise dining spaces are so perfect, you'd never want to leave them. Far away from the beach, the tropical setting is possibly most well lived in this tree top dining plateau! Taking the shape of a tree house with a sophisticated difference, there are few that could refuse a meal out on this wooden structure. Though few of us are lucky enough to have a garden of paradise standards, there's no reason why you can't bring the outdoors inside! Opt for a beautiful wooden dining suite and pair with bright cushions, prints and table settings to subtly add that Hawaiian vibe. For those with the homes to suit it, a truly elegant dining room is a must for dinner parties and impressing those undoubtedly influential guests. Stunning views, chandeliers and decadent place settings are all commonplace in the ultimate classy dining room. For those three criteria, it doesn't get much classier than what Pinterest users are citing as 'the most expensive penthouse in the world'. Sitting in Monaco, this apartment nails the panoramic view, glass chandelier and immaculate table setting categories, as well as bringing a new edge of interior decorating into the mix. Dark ceilings - if high enough - can always add a touch of sophistication to a room, as do lavish rugs on cooling tile floors. Heaven! Of course, it doesn't have to be all about the view either. High ceilings can add the wow-factor, and in the image above, this height it accentuated by the hanging chandelier chains. Ceiling alcove lighting helps to soften the height of the space, while mirrors continue to add depth - a tricky balancing act to perfect, but one that works here. Glass dining tables and luxurious white seating is a common theme in high-end dining rooms - but it doesn't have to cost the earth! Add a large mirror into the space (a great way to make a room feel larger) and accentuate with glass vases, ornaments and candle holders for an opulent look on a budget. Though often thought to go hand-in-hand with the paradise-themed style, the beach look is something altogether different. Subtle colours mix with white and washed wooden tones here, and often, the sea views seem to allow for a less formal look in the room. Here, soft fabrics and cushions are most definitely a 'yes', and of course, the style is always accentuated by a good view of the ocean. 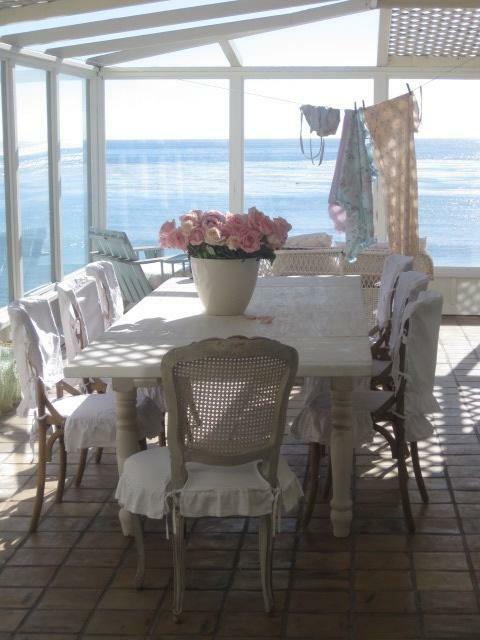 White linen and fresh flowers are a must for any beach side dining room, and whitewashed furniture helps add to the look without detracting from the views out of the window. As such, a room with a lot of window space is always a good aid to the style too, given that they've got that perfect location of course! If you've the space, there's no reason why you can't embrace the informal dining room vibe with open arms! Swap traditional dining chairs out for comfier counterparts and dress with cushions for an alternate dining room look that's still in keeping with the beach theme. Light wooden tones work really well in these kind of dining spaces, and oak fits the bill perfectly! 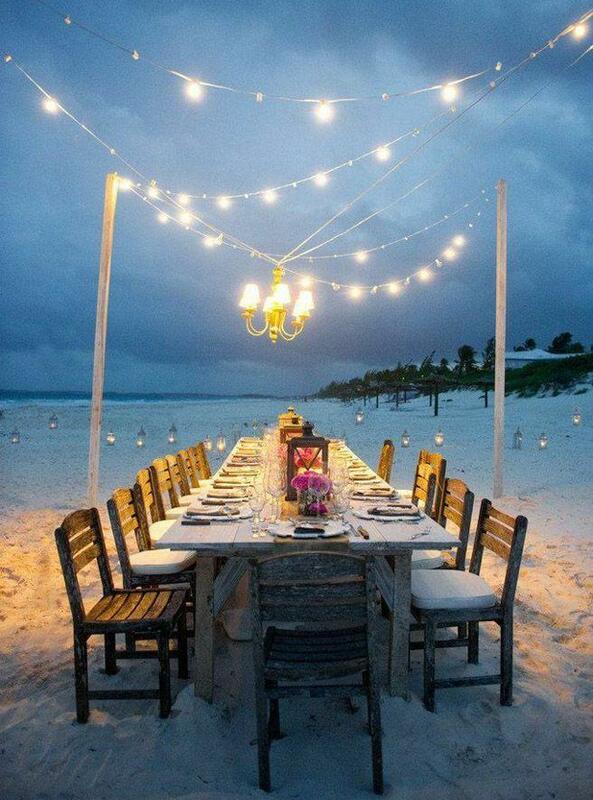 Accessories can assist in bringing the beach theme into your living room, no matter how far you live from the coast! Cork placemats, wooden candle holders and plants can all help implement those natural, coastal elements, and don't forget, a statement beach scene print or canvas can make the beach feel a whole lot closer, even if it's miles away in reality! When it comes to embracing the rustic, shabby chic look, wood always rules. Though quite a versatile material in terms of the amount of styles wood suits, it's fair to say that the rustic theme is where it's most used. 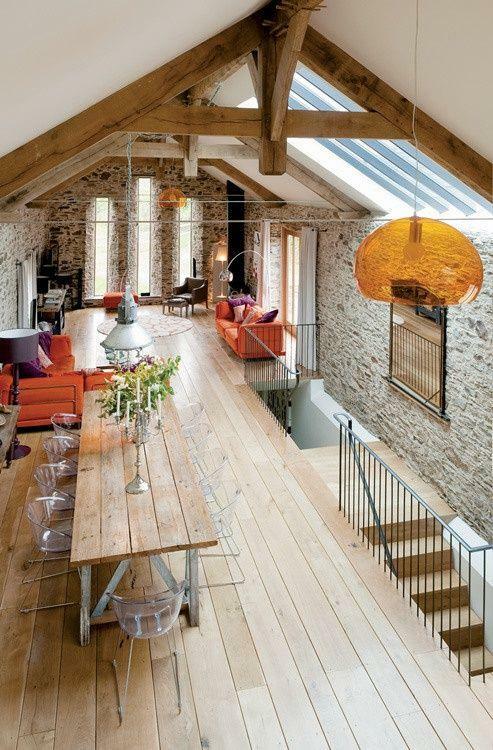 Wooden floors, wooden tables and wooden beams are a formidable trio here, but forgiven, given the height of the ceilings and the amount of natural light that's able to filter through. Open plan living perfectly complements the rustic theme too, and it's in the details through which you can really make a space stand out. It might be a single, gorgeous tub chair or recliner. Or you might prefer to contrast neutral furnishings – a luxurious leather sofa suite, say – with stronger colours in your decorative touches, such as artwork or curtains. Either way, colour adds dynamism to a small living room. From wooden dining furniture to lovely grey sofas, the rustic look is about investing in staple pieces that you can then accessorise with as many (or as little) shabby chic pieces as you like. 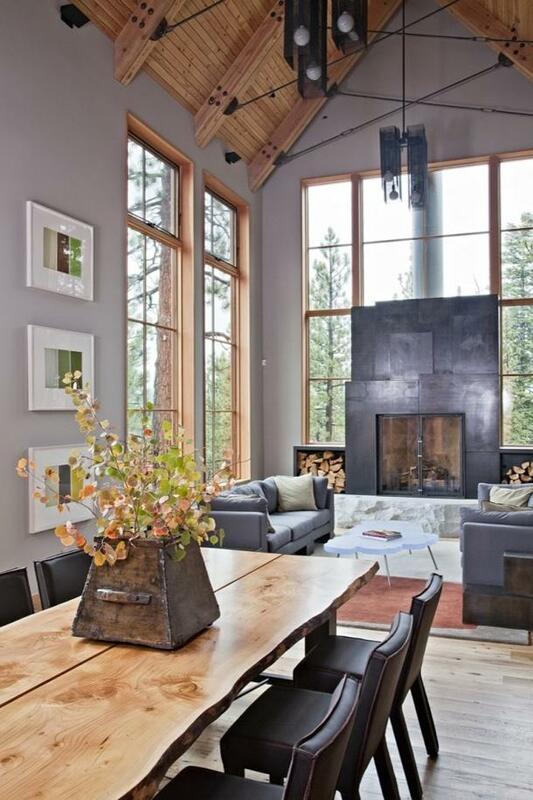 The essence of the rustic look is that imperfection is best! This means lots of handmade photo frames, burlap table runners and too many cushions can all help create the perfect cosy space without it needing to look totally polished the entire time - a perfect option for busy families! If haphazard cosiness isn't quite your thing, then look no further - the growing minimalism movement is here to soothe your mind. Here, expect amazing dining spaces to embrace greyscale monochrome and modern materials - but don't be surprised by their implementation of natural elements too. Some may call it impersonal, others see the slick surfaces and clean, angular lines of building and complementing furniture a total pleasure to look at. Wooden flooring is yet again a favourite here, but paired with luxurious white seating and a strict, coherent colour theme the look is certainly striking. 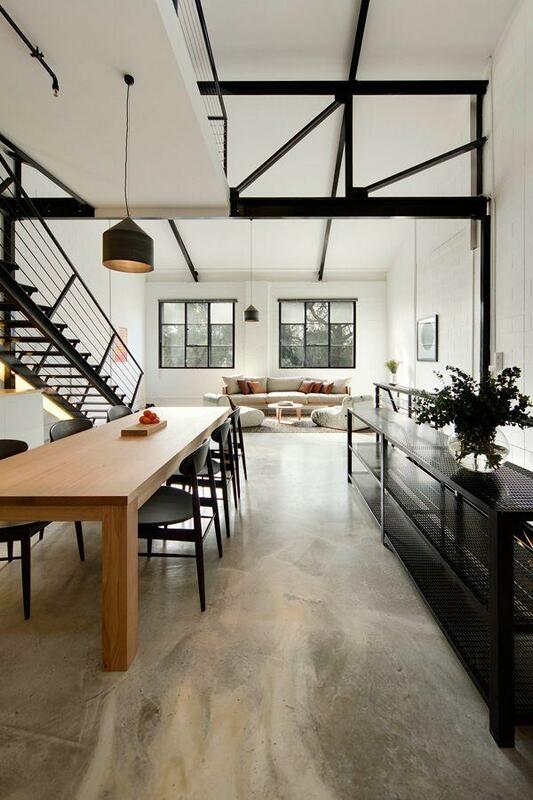 The theme is a great one for being able to incorporate industrial design elements into the room. Though chrome is no-go, black is a definite 'yes', and can make things as basic as staircases or beams into a statement. It can take a radical decision to whitewash your entire room from floor to ceiling, but that's not always required to be able to use this theme well. White tables can really brighten a room, and are easily paired with black seating to create that statement through larger furniture pieces.